[ABRAHAM LINCOLN] SCHUYLER COLFAX. 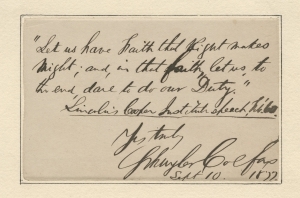 Autograph Quote Signed, from Lincoln’s Cooper Institute speech given on February 27, 1860. Sept 10, 1877. “Let us have faith that Right makes Might; and in that faith, let us, to the end, dare to do our Duty.” Lincoln’s Cooper Institute speech, Feb. ‘60. Schuyler Colfax (1823-1885), born in New York City, moved with his family to Indiana when he was an adolescent. Colfax pursued a career in journalism, serving as legislative correspondent for the Indiana State Journal and becoming part-owner of the Whig organ of northern Indiana, the South Bend Free Press (renamed the St. Joseph Valley Register in 1845). Colfax was a member of the 1850 state constitutional convention, and four years later was elected as a Republican to Congress, where he served until 1869. An energetic opponent of slavery, Colfax’s speech attacking the Lecompton Legislature in Kansas became the most widely requested Republican campaign document in the 1858 mid-term election.